Disclaimer: ChiIL Mama is elated to be a Best Buy WOLF (Women's Leadership Forum) Blogger. I have been compensated in the form of a Best Buy Gift Card and/or received a product/service at a reduced price or for free in exchange for sharing this information with our readers. All opinions are my own. We got out of town for a quick family vacation last weekend. Of course we still managed to bring 2 laptops, a DSLR camera, a DS, a 3DS, an ipod, an Android pad, and 3 Samsung smartphones. But it was GREAT to be away from my Macbook Pro more than usual. It's like a permanent extension of my hands most days, and my favorite way to stay connected. Sure, I use my smartphone a LOT, but my laptop is ideal for blogging, freelance writing, photo & video editing, managing e-mails and social media posting. So, it's by far my tool of choice for multitasking madness in March and beyond. It was amusing to me to see the NCAA March Madness in full swing everywhere we went. Even at The Eagle Ridge Spa & Resort pool... basketball addicts were absorbed in the games, while the kids (& hockey dad) shot baskets from the water. How do YOU stay connected... HDTV, Laptop, Tablet, Cellphone... all of the above?! 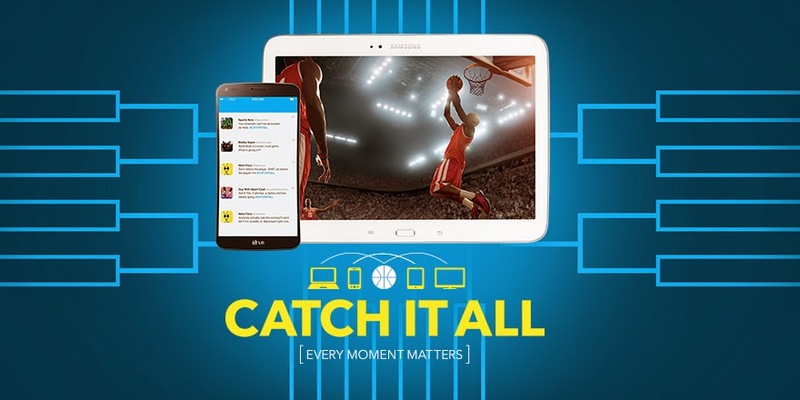 Check out Best Buy here, for sweet tips on using “multiple screens” to stay current on the tournament and brackets and sweet March Madness promotions and offers focused on the devices to enjoy “multi-screen” madness on. One screen is not enough. Speaking of one screen... last Friday this Blackhawks lovin' family was 3 hours away from home road trippin' to our weekend away, when the game was just about to start. We spotted a likely sports bar/barn/fish fry joint and stopped for dinner. There was Blackhawks neon in the windows and jerseys on the walls, but all 10 large screens in the place were playing... you guessed it. COLLEGE BASKETBALL. We asked if they could switch one little ol' large screen to the Blackhawks game and our waitress tried to oblige, but it was not to be. All the TVs were chained in sync and the channel could not be changed. Bah! At the risk of basketball fanatics playing bombardment with my head.. I must confess, we used all our multiple screens trying to AVOID March Madness and track the hockey game! Ah well. To each his own. Follow your passion. And whether you're tracking tournaments and brackets or hiding in another room watching movies on your laptop... When it comes to screens, more is better. And Best Buy's got your back. Best Buy helps keep you connected to the excitement with the devices and connectivity that make it possible. Brought to life by the brand promise of the latest devices and services, all in one place. Disclaimer: Once again, ChiIL Mama is elated to be a Best Buy WOLF (Women's Leadership Forum) Blogger. I have been compensated in the form of a Best Buy Gift Card and/or received a product/service at a reduced price or for free in exchange for sharing this information with our readers. All opinions are my own.